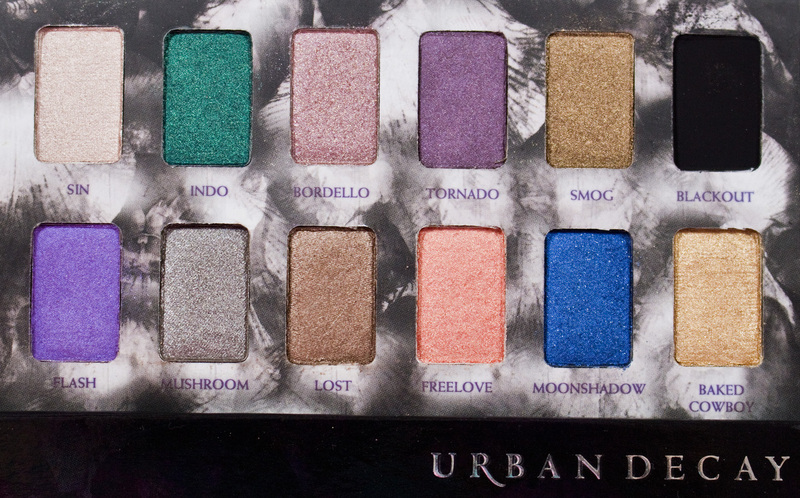 Urban Decay Shadow Box in Sin, Indo, Bordello, Tornado, Smog, Blackout, Flash, Mushroom, Lost, Freelove, Moonshadow, & Baked Cowboy. The Urban Decay Shadow Box Palette retails for $34US or $43CAN for 0.05oz/1.3g x 12 worth of product. Basically, each pan is 3/5th the size of the naked eyeshadow palette pans. This contains 8 out of 12 shades that a permanent to the Urban Decay eyeshadow line so it's a great chance to pick up the shades at $3.4US compare to the $18US single price. 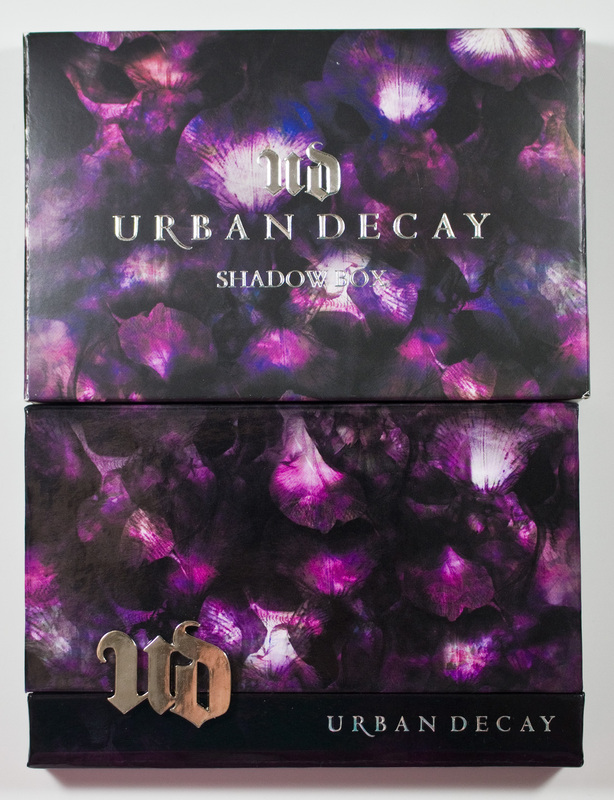 Urban Decay Shadow Box Palette & Box fronts. 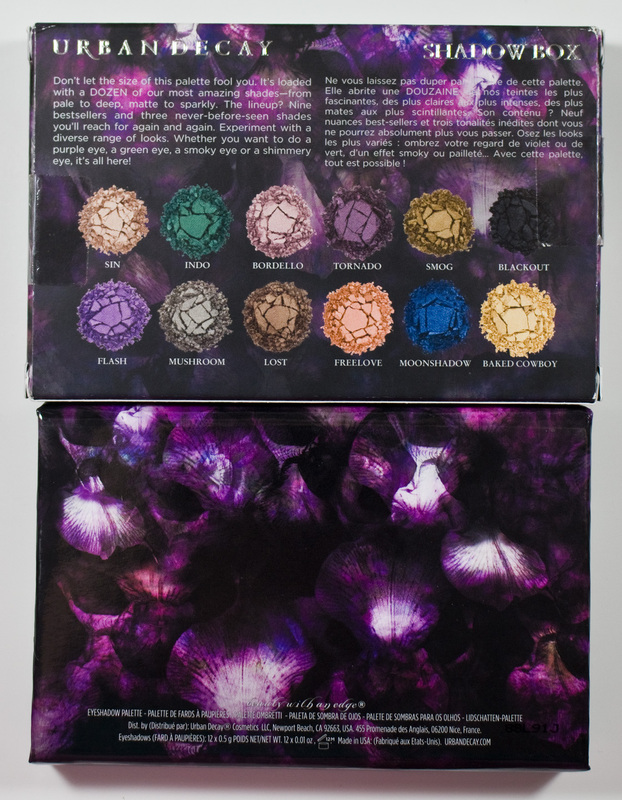 Urban Decay Shadow Box Palette & Box backs. 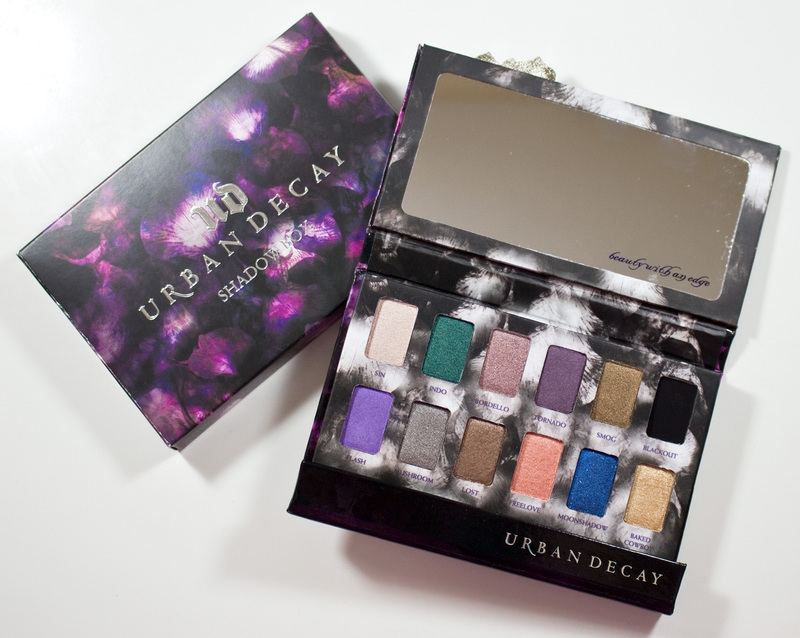 Urban Decay Shadow Box side. 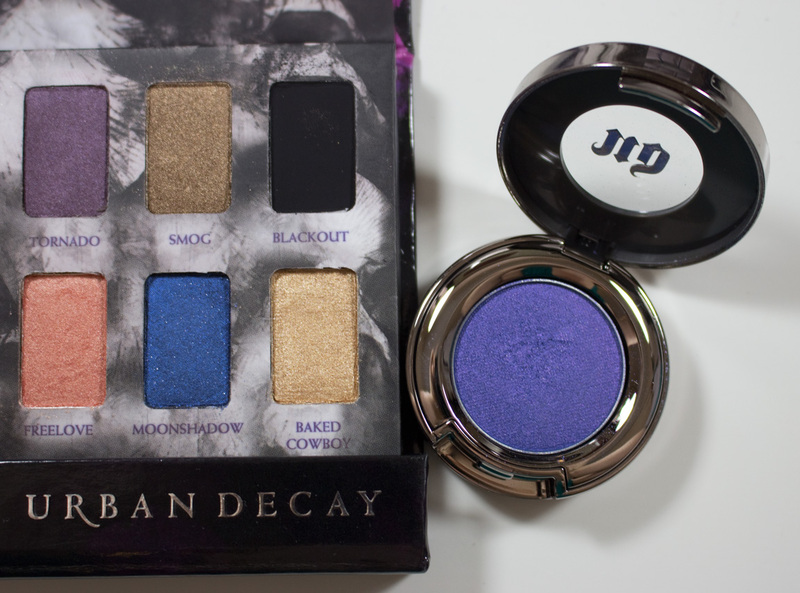 Urban Decay Shadow Box Palette next to full size token eyeshadow. Indo, Bordello, Tornado, Smog, Freelove, and Baked Cowboy: Mica, Talc, Diisostearyl Malate, Dimethicone, Zinc Stearate, Caprylyl Glycol, Phenoxyethanol, Hexylene Glycol, Tin Oxide, Tetrasodium EDTA, Silica, Caprylic/Capric Triglycerides, Calcium Sodium Borosilicate, Synthetic Fluorphlogopite, Calcium Aluminum Borosilicate, Polyethylene Terephthalate, Acrylates Copolymer. Blackout: Polyethylene, Diisostearyl Malate, Dimethicone, Isopropyl Titanium Triisostearate, Caprylyl Glycol, Phenoxyethanol, Sodium Lauroyl Aspartatel, Hexylene Glycol, Tetrasodium EDTA, Zinc Chloride, Silica, Talc, Caprylic/Capric Triglycerides, Calcium Sodium Borosilicate, Synthetic Fluorphlogopite, Calcium Aluminum Borosilicate, Polyethylene Terephthalate, Acrylates Copolymer, Tin Oxide. The shimmer and pearl shade all were nice to work with and pigmented as well. The matte Blackout shade however, was drier than the standard Urban Decay formula sadly but still workable. The one thing I did notice was all they shades reminded of the Original Urban decay formula as they are less creamy in texture compared to the current one. But this does not affect the quality of the shadows at all except int he same of Blackout. Sin is a pale rose champagne with a pearl finish. Indo is a bright emerald green with a shimmer finish. Bordello is a pale dusty pink with a shimmer finish. Tornado is a light plum with a shimmer finish. Smog is an almost khaki bronze metallic. Blackout is a charcoal black with a matte finish. Flash is a bright purple with pale blue shimmer. 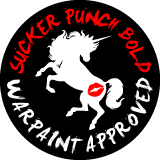 Mushroom is a warm silver taupe with a shimmer finish. Lost is a warm brown with a shimmer finish. Baked Cowboy is a bright gold with a metallic finish. Wear: 6 hours for the shimmery/pearl shades on bare skin and 5 hours for the matte Blackout. Packaging: Cardboard magnetic palette with a mirror. This one is heavier compared to the Urban Decay Ammo Palette but not too heavy either. I think because there is more cardboard involved in this palette and a larger mirror. Not eh interesting thing I have to point out is that the pan size is identical for the Urban Decay Ammo Palette for 10 x 0.8g/0.03us oz worth of product. But this Urban Decay Shadow Box has 12 x 0.05oz/1.3g worth of product which sounds like you getting less eyeshadow but I think because the base formula is less dense in this palette this is causing product the weight lighter. 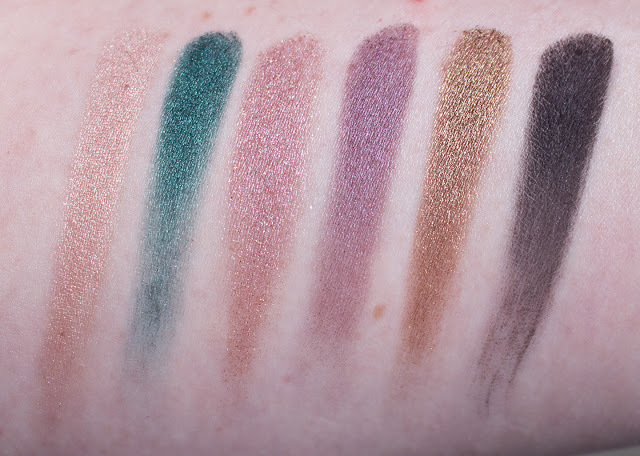 Daylight swatches: Sin, Indo, Bordello, Tornado, Smog, & Blackout. 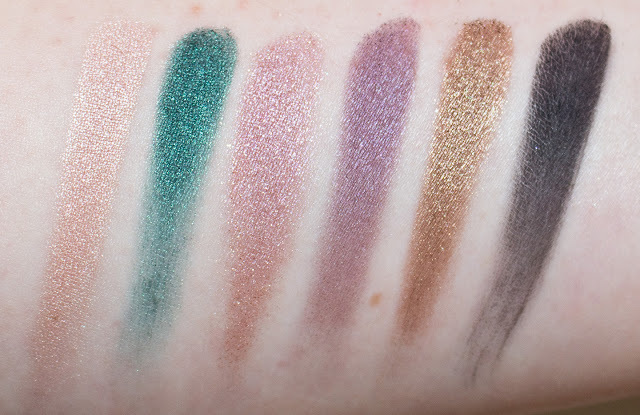 Flash swatches: Sin, Indo, Bordello, Tornado, Smog, & Blackout. Daylight swatches: Flash, Mushroom, Lost, Freelove, Moonshadow, & Baked Cowboy. 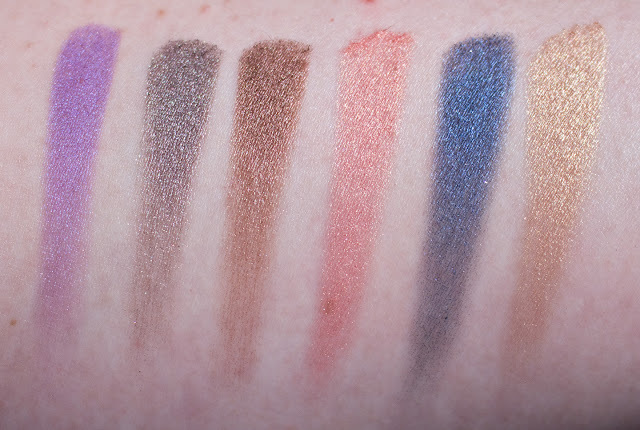 Flash swatches: Flash, Mushroom, Lost, Freelove, Moonshadow, & Baked Cowboy. Daylight swatches: Shadow Box Sin, Sin pan, Shadow Box Smog, Smog pan, Shadow Box Blackout, Blackout pan, Shadow Box Freelove, Freelove pan, Shadow Box Baked Cowboy, & Half Baked pan. Flash swatches: Shadow Box Sin, Sin pan, Shadow Box Smog, Smog pan, Shadow Box Blackout, Blackout pan, Shadow Box Freelove, Freelove pan, Shadow Box Baked Cowboy, & Half Baked pan. Shadow Box Sin look paler/ less shiny compared to the current Sin pan eyeshadow because it lacks the gel base formula. The shade is the same though. Shadow Box Smog and Smog pan eyeshadow are the same shade but the current one looks more metallic with the gel base formula. 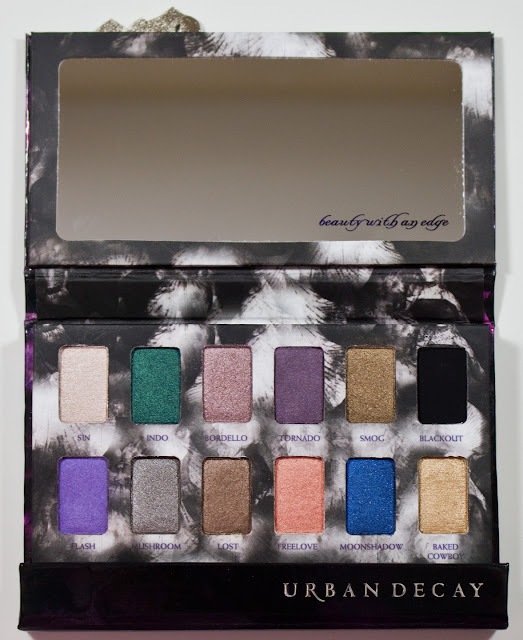 Shadow Box Blackout is drier and less pigmented Blackout pan eyeshadow. Shadow Box Freelove is slightly pinker compared to the Freelove pan eyeshadow. Shadow Box Baked Cowboy is a lighter version compared Half Baked pan. 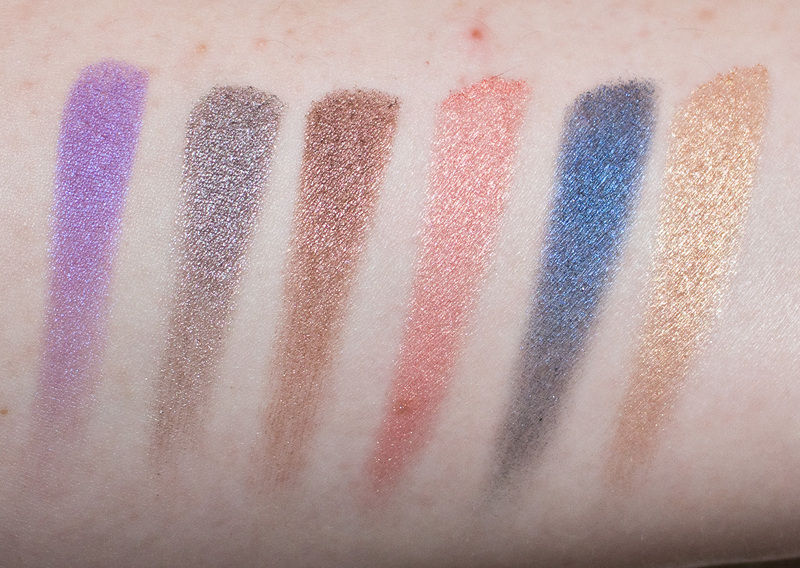 Although the formula is not the same as their current pan formula the shades are just as good as their full-size counterparts and it's a great way to expand your Urban Decay collection.